Internet-enabled robotic devices intrigued many of the people who learned about new applications for the first time at CES 2016, others may have already known the numerous commercial use-cases for what's commonly referred to as the Internet of Things (IoT). According to the latest worldwide market study by IDTechEx Research, the greatest trend will be the growing adoption of mobile robotics. Over the next decade the statically-mounted robots of today will become a minority as next generation robots travel across the ground, in the air and even across oceans and in space. Autonomous unmanned ground vehicles (UGVs) will transfer goods within warehouses, down highways alongside conventional passenger vehicles and around mines and quarries with minimal human intervention -- as well as harvesting crops and other practical applications. Unmanned aerial vehicles (UAVs) will introduce internet access to millions of people in remote locations, bring emergency medical attention to those in need and monitor and dust our crops. Autonomous underwater vehicles (AUVs) will be used to mine the ocean floors for precious minerals and coast guards around the world will employ autonomous robotic lifeboats for search and rescue. Although advances in mobile robots will be a big trend, static robots will also continue to evolve. Surgical robots have already made inroads for specific laparoscopic procedures, and medical device companies will be creating more surgical robots for various other kinds of operations. What were expensive high-end machines a few decades ago will be modularized into interoperable parts (joints, end effectors and so on) and commoditized as they are mass produced cheaply in East Asia. This will make robotics affordable for nearly everyone, facilitating the teaching of robotics in technical schools within most emerging markets and the development of next-generation robots by hobbyists. The ageing population across the globe will benefit from surgical robots, lab robots for medicine and robotically-manufactured replacement bionic parts. Also, service robots will be designed to help the elderly at home. All of these nascent sectors within the robotics marketplace will eventually grow to overshadow traditional industrial robot arms. 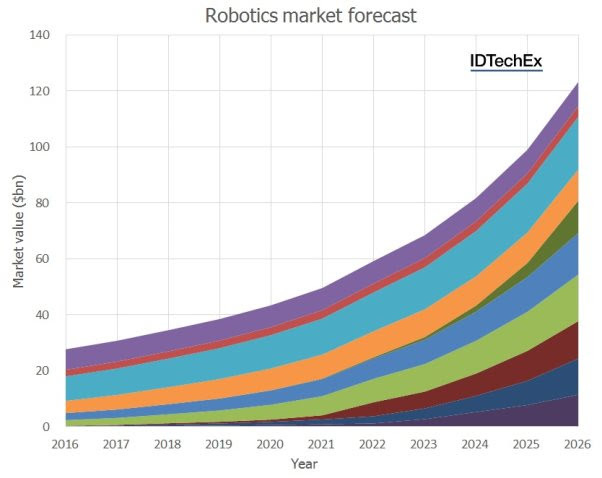 According to the IDTechEX assessment, over the next 10 years they forecast that the overall worldwide market for robots to reach over $120 billion in revenue.